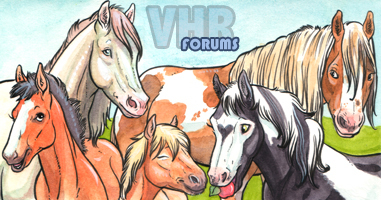 virtualhorseranch.com • View topic - Violation Point Policy ~ AKA The RULES. Violation Point Policy ~ AKA The RULES. This policy will begin being enforced on Thursday January 8th 2009. Note that the policies do pertain to all areas of the game, not just the forums and chat room. All Violations have been assigned a point value. Each violation will cause the user to have those points marked to their name. Suspensions and Bans will be enforced when certain point totals are reached. These penalties pertain to ALL parts of the forums. Spamming / Flooding - this includes spamming players via pm, mass bumping of posts or flooding / spamming posts with smilies / icons and the likes. This also includes click spamming for things such as dragon eggs. It is NOT allowed. Posting topics in the wrong sections. Theft - Stealing peoples artwork, banners, layouts and using them as your own without permission. This also includes tracing / replicating other peoples photos, artwork without permission. Theft #2 - Plagiarism of any form. Creating multiple accounts to claim to be new and scam players out of things. Posting material of an adult nature will result in an auto permanent ban. This list will be edited and updated as needed. All Ops reserve the right to adjust the penalty given depending on the severity of the offense. Also, players will be notified via Forum PM when they receive points or a penalty so they will know how many points they've accumulated. Points will also have a reset feature, if a player gets points and goes 1 year without further points, then they will be reset to 0 for that player. Permanent Bans will be reviewed after one year on a case by case basis as to whether the ban will be removed or not. If a second chance is given, any violation will result in an auto perma ban that will not be lifted. Added: This pertains to bans received from this new system and does not pertain to previous bans and infractions. Also note: Abuse of forum features, such as signature violation, excessive post bumping, reporting features, give away threads or any other forum feature, will result in one warning, then removal of the warned players use of the abused function. All Violations have been assigned a point value. Each violation will cause the user to have those points marked to their name. Suspensions and Bans will be enforced when certain point totals are reached. Any other Ban from the Room Bot - The bot auto bans on the 3rd kick for Caps, Colours, Flooding, Spamming, Swear Words. Tricking or Provoking others into getting banned - using any methods to trick players into leaving chat or to provoke and pick at them so they end up doing something to warrant a ban. Added: Also note, that violations made while an op is not active during the the infraction, will still have points placed accordingly. Most of us do log chat while we sleep and we do review the logs daily. Posting material of an adult nature will result in an auto permanent ban and will be reported to the Chat Network Admins as well. Added: Spamming / Flooding: Chat ads. Please, at night, if you're going to sleep or what not (U.S. time zones.) Do NOT leave ads running. The chat is usually empty during these hours, leaving the room filled with a flood of nothing but ads. Note also, that this will not add points, but will most likely result in a temp ban on your host, to stop the flooding. If the ban has not been removed before you return, contact an Op to have it removed. Update: For chat, we have agreed to allow posting of You tube links so long as they are of acceptable content. Any player posting videos that contain anything in violation of the rules, will receive the 12 point penalty and a suspension from the chat, so be sure to double check links before sharing anything. Last edited by Hawk on Mon Feb 09, 2009 8:56 am, edited 12 times in total. Violation Point Policy for Forums & Chat ~ AKA The RULES. Note, this policy will not go into effect for a couple of days, to give players time to read it over and ask any questions they may have. Newest addition is 4 point violation for posting in the wrong sections. The forums section are clearly labeled as to what goes where, and have been for a few years now. Yet we still have a large number of players posting in the wrong sections and oddly, most are older or long term players that should know what goes where by now. The occasional slip up from a new player is understandable, but 9 out of 10 posts I've moved recently, have all been from players that have been on the forums for a couple years now. Examples: what should i sell this for? (potential sales) in general discussion or other NON sales sections. Is anyone interested in starting *insert event type here* with me? in sections other than the Eventing connection. Anyone have *insert item or service here* for sale? in sections other than the wanted sections. And many more, but those tend to be the most common.